Home » The Horse » Language » What does the swishing of the tail mean? What does the swishing of the tail mean? Sometimes a horse swishes his tail just to get the bothersome flies off them. He might swish his tail because the saddle or the bit doesn’t fit properly. A bad saddle or wrong bit causes all kinds of problems which can be expressed through the swishing of the tail. Sometimes it’s a sign of greater discomfort and the horse swishes his tail because he’s really uncomfortable or in physical pain due to some issue with his back muscles, spine, pelvis or anywhere else in the body. Sometimes a horse swishes his tail because he’s very much out of balance, or the rider is out of balance, causing imbalance, or not able to help the horse find balance. Sometimes a horse swishes his tail because of too much pressure during training or that he’s not enjoying the training because of the way the aids are applied (too much, too long). Sometimes a horse swishes his tail because he’s a little out of his comfort zone and in the ‘stretch zone’ physically seen, while doing difficult exercises. Sometimes a horse swishes his tail when he’s learning something new that is confusing him a little, mentally seen. Sometimes a horse swishes his tail because he’s really putting in an effort in his job. Sometimes he’s swishing his tail because he’s really concentrating on the task. Sometimes he swishes his tail to express pleasure and contentment. Sometimes the tail expresses the physical condition of the horse, sometimes the mental state and degree of concentration and sometimes the emotional mood of the horse, and sometimes all three combined. Tail usage and positioning is part of the horse’s complex language and a way for the horse to express themselves and to send a message. There are many different conditions that cause the tail to move in a swishing way. It’s up to us as the rider/handler to notice and do our best to assess. However, we humans like to simplify things, and it’s very tempting to assume that for example tail swishing while riding ALWAYS means a bad thing and NEVER can be good, it’s very tempting to label it in black/white, good/bad, right/wrong. But when it comes to translating the language of the horse, it’s best to avoid fixed assumptions and ‘false’ beliefs and to always take the context into consideration. Remember, the map is never the territory. You have to take in the whole situation, not just a part of it, to understand why the horse does what it does in a certain moment and situation. We must observe carefully and know our horse to figure out exactly what it means. During Straightness Training sessions we are always trying to teach a horse something new and/or trying to improve things he already knows. 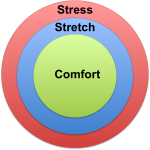 This means we will work the horse not only in his ‘comfort zone’, but we will also try to ‘stretch’ him, both on a physical level as on a mental/emotional/spiritual level. Of course, we try to avoid the ‘stress’ zone at any times. The tail is a good indicator of in which zone you are. 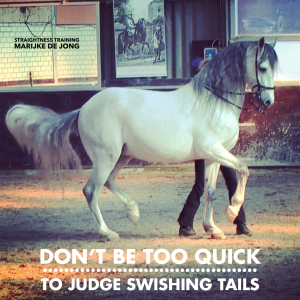 In the ‘stretch’ zone it’s very common that a novice horse starts to swish his tail, either because he doesn’t completely understand our new request and is a little confused, or he finds it difficult to perform what’s been asked physically seen. 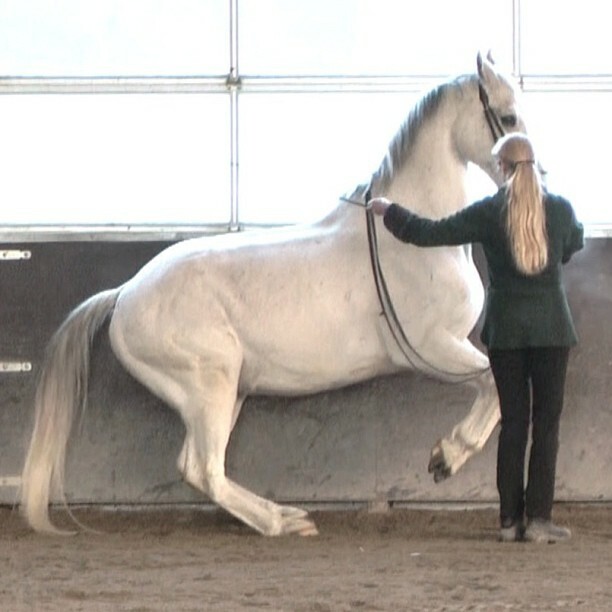 Also, an advanced horse might tend to show more tail movement when he gets really focused or is working hard, especially if it is a move he really enjoys or one that is challenging, such as the piaffe or the pirouette or – as shown in the picture – the piaffe pirouette. You can compare it to human athletes: when an athlete appears to have a grimace on their face or make loud noises when they, for example, lift heavy weights. In this context, it can mean concentration and determination. During a proper education of the horse, his comfort zone will get bigger. 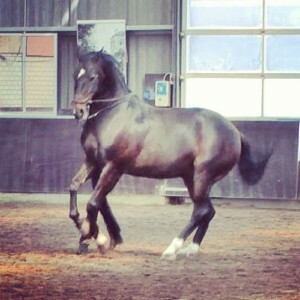 Over the years the horse will learn more and more and he will start to use his body in a more balanced and symmetrical way and more and more exercises start to feel comfortable. Thanks to this proper education his mental capacity to learn, and his balance, his muscles, and his movements will change and improve over the years and he will use his tail more and more in a balanced way, but that doesn’t mean he will not swish his tail ever. So when a horse is working really hard and paying close attention in Straightness Training, often he’ll express this with his tail, – and often also with his ears and face – showing that he is trying his best to perform the exercise. Together they form an entire language of the horse. 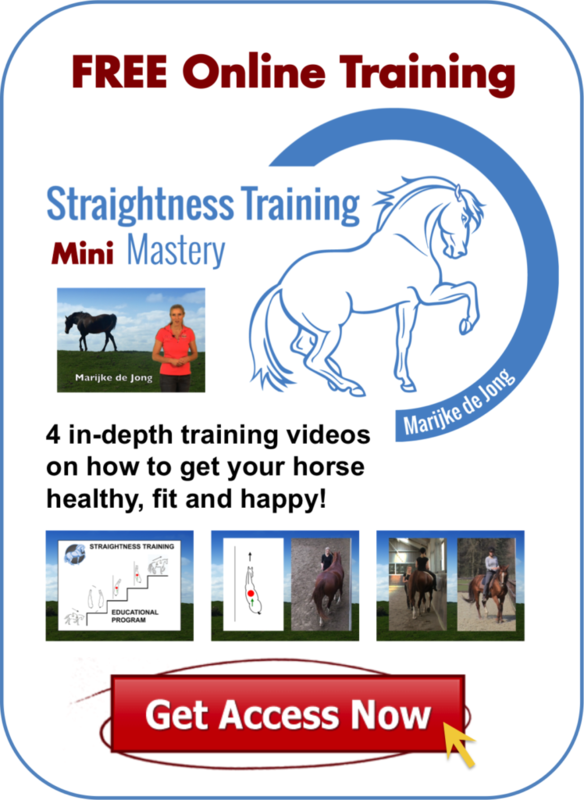 If you’d like to get started with Straightness Training or have a taste of what ST is about, then join my free 4 part Mini Mastery Course! Six simple keys to making horse training and riding easy, no matter what discipline you’re in, and no matter what breed or age! This mini-course really is worth watching – not only useful insights and tips, but also seeing the learning stages that both a less experienced and more experienced horse had to go through to achieve the desired results. There could be lots of factors. If he is doing these things only when asked to perform, he could be in pain. I suggest he see an equine specialist for a lameness check. He could be experiencing joint pain in jocks or stifles. I would start there first. Hi Lisa, it’s very hard to give advice without actually seeing the horse. Best is to contact a veterinarian first to rule out that there is a physical issue.